Hi, I am interested in your 1999 Pontiac Firebird (stock #5110-CHA) listed on Autotrader for $12,995. I'd like to get more information about this vehicle and confirm its availability. 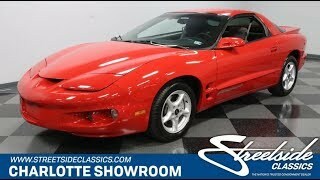 A well-maintained and distinct modern classic is what you get with this 1999 Pontiac Firebird Formula. The fact that its a V8-powered and loaded sports machine (A/C, full power, etc.) at such an affordable price is just the cherry on top. This was the last evolution for the Firebird, and its arguably the best of the breed. The front end lived up to the Firebird name as the hidden headlights helped created a swoopy design that looks like a bird in flight. Plus, this car has a sleek wind-swept profile, and rear spoiler is part of an expertly integrated design over the whole hatch. So when its finished in a bright red, you know its a package that will command attention for years to come. Plus, the details are nice on everything from the famous screaming bird logo on the b-pillars, to the quad exhaust tips, to the bright 16-inch factory alloys. The dark interior looks fantastic against the red paint. The high-back bucket seats are finished in a comfortable gray cloth, the steering wheel has radio controls, and you have a factory center console with cup holder so you know this is a drivers machine. In fact, this whole interior is set up for someone who enjoys the drive. Thats why it comes with great features like cruise control, power windows, power mirrors, power locks, dual airbags, tilt wheel, and cold-blowing air conditioning. Plus, youll love the factory Monsoon AM/FM/CD stereo w/equalizer. But we really know your favorite soundtrack starts from under the hood. Another advantage of these later final-generation Firebirds is the availability of the Corvettes LS1 5.7-liter V8 powerhouse. This one looks exceptionally tidy and show all the right signs of being original. The fuel-injected lightweight all-aluminum motor is part of the modern era of sweet powerplants, and this one was rated at 305 hp right from the factory. This performance is backed up by four-wheel disc brakes and a great handling package with sway bars front & rear. But more than just a pure performance machine, this one is great for any time driving thanks to features like power steering, anti-lock brakes, and the four-speed automatic transmission w/overdrive. Complete with owners manual, this is the fuel-injected modern classic that has the right look and the right price to be irresistible. Call now!